Established in 1979 in California’s Bay area, the Coffee Roastery was opened by Deborah London and then partner, Norm Weintraub. 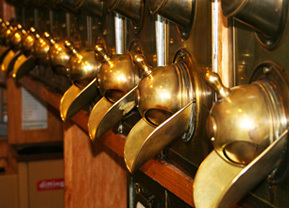 In that era, coffee roasting remained behind the scenes and was not meant to be experienced by the customer. 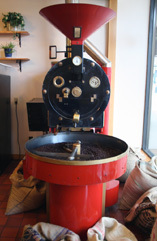 They came up with the idea that it would be much more interesting to bring the roaster into the store and roast on site for their customers to enjoy. She was then the first woman roaster in the area. Today Deborah and husband, Kelly London, continue to own and operate 2 stores in Marin County: Fairfax Coffee Roastery and San Anselmo Coffee Roastery. The Buffalo Coffee Roastery was opened in 1994 by current owners, Kate and Sean Edwards. After several trips to California to learn the roasting process from her sister, Kate thought the Western New York market was ready for specialty coffee. Using a 12 kilo San Franciscan coffee roaster, Buffalo Coffee Roastery was the first coffee house in the area to roast on site. For over 18 years, Kate continues to fine-tune the roasting process using this beautiful piece of equipment. Customers can actually experience the production, savor the aroma, and enjoy freshly roasted coffee right in their store.